Traveler Communities brought to you by the Digital Space Commons is one of the most exciting revolutions to hit the Internet. Talk in your own voice to other people represented as fantastic lip-synching avatars. Travel through breathtaking 3D worlds and experience life as an avatar. Traveler brings you the future face of cyberspace! Download Digital Space Traveler From: http://www.digitalspace.com/traveler and visit the Community Directory and Documentation. Find a partial listing of Traveler communities at Traveler Community Directory and Documentation. Phil Harrington, Paul Godwin and Kevin George and his CyGaia crew hold their fabulous VOCE experience in Traveler. 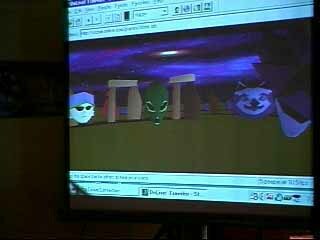 Avatars gather in the virtual world and are seen on a giant screen. Together, they exchange song, drums and the seven chakras live with a circle of friends seated at a live event. As the pictures above show, the combined voice of the group emanates through one avatar while other people in-avatar draw near to listen and join in song. Find JM's full and dynamic listing of Traveler communities, server status, and real-time inhabitants on DigitalSpace's website at Traveler Community Directory and Documentation..
Find our full and dynamic listing of Traveler communities, server status, and real-time inhabitants on DigitalSpace's website at Traveler Community Directory and Documentation. Purple Tears has been a community leader and world designer par excellence for years, see her work at http://www.prpletears.com. http://www.travelerministries.com is Steve Turner's Christian/Chaplin space for the community. Former comprehensive list of Traveler sites including entry teleport links at Traveler Worlds Alliance and its Traveler Web Ring. OLGate was a former Traveler community community hosted at Silvercities. Turbo had a great community at http://members.home.net/onlive. 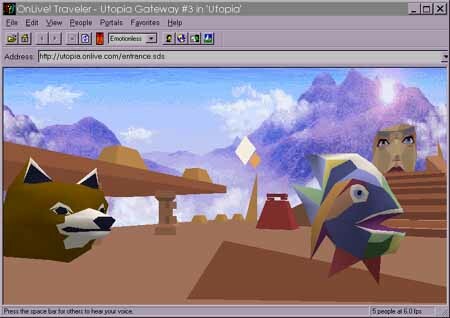 Utopia was Traveler's original community. From Utopia you can travel out and explore different areas and worlds, including the orignal entry plaza, mystic ruins at Stonehenge or the wacky Duckworld. Utopia was formerly hosted at the U.T. Austin ACTLab. � 1996-2003 DigitalSpace Corporation, All Rights Reserved.